Ever think about becoming a teacher, but the traditional college preparation programs don’t fit in with your busy life? 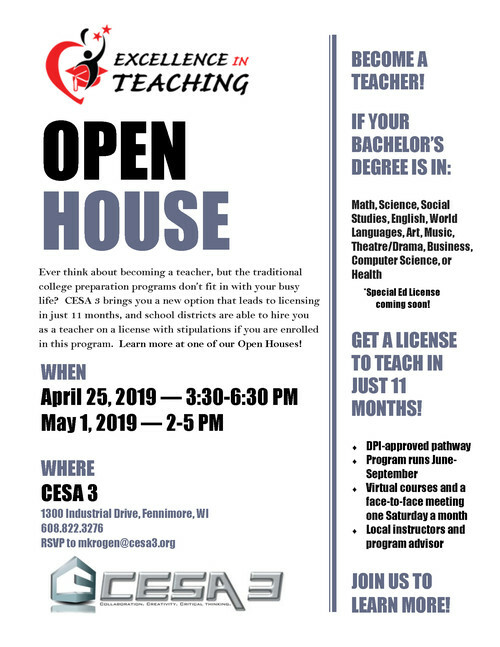 CESA3 brings you a new option that leads to licensing in just 11 months, and school districts are able to hire you as a teacher on a license with stipulations if you are enrolled in this program. Learn more at one of our Open Houses! CESA 3 has partnered with UW-Oshkosh's CAPP program in an effort to help teachers from our region get HLC accreditation at a reduced cost. For those teachers who don't have a master's degree, consider UW Oshkosh's Master's in Teaching & Learning, which embeds content courses into the master's program to fulfill requirements. For those teachers who already have a general master's, UW Oshkosh offers graduate courses in a variety of content areas which will meet HLC guidelines. This will allow teachers to teach in the CAPP program, which will help cover tuition costs; however, teachers can also teach for other entities, like technical colleges, etc. The application is included here, appropriate for those seeking a master's OR content credits. Please note: In order to get the reduced tuition rate, applicants must check "Other" in the Student Status section and write "CESA 3 COHORT." Also linked here is a list of upcoming summer course offerings, including Phy. Ed. Note that CESA 3 is a conduit, responsible for disseminating information only. This program is run through UW Oshkosh, so please contact them directly with further questions (info found on application). Please encourage your teachers to utilize this program (or another) to provide college credit opportunities for the students in CESA 3. Thanks for all you do! More than 20 staff members from 11 CESA 3 school districts attended Language Acquisition through Motor Planning (LAMP) training late last year. A total of 26 staff members from Benton, Boscobel, Cuba City, Ithaca, Mineral Point, North Crawford, Platteville, Potosi, River Valley, Riverdale and Shullsburg school districts attended the Dec. 15 training, as well as educators from Stevens Point and Kenosha. Readiness to learn, engaging the learner in motivating activities, and learning language through a unique and consistent motor plan paired with an auditory signal and a natural consequence. Discussion included how LAMP addresses the core language deficits of autism, device features that are beneficial to teaching language, and how to use those features to implement the LAMP components. Language Acquisition through Motor Planning is a therapeutic approach based on neurological and motor learning principles. LAMP gives individuals who are nonverbal or have limited verbal abilities a method of independently and spontaneously expressing themselves with a voice output alternative augmentative communication (AAC) device. The components of LAMP address the features and vocabulary available on the device as well as the method of teaching communication while taking into account the individual’s sensory needs. LAMP was initially developed to give nonverbal individuals with autism a means of communication, but can be adapted to benefit individuals with a variety of disabilities. It’s often noted that as communication skills improve, social engagement will increase, problematic behavior will decline, and some individuals exhibit increased verbal speech. Nearly half of the thousands of children diagnosed with Autism Spectrum Disorder each year are unable to verbally communicate their needs, desires, thoughts and dreams. The mission of the Center for AAC and Autism, based online at www.aacandautism.com, is to improve awareness of the power of alternative augmentative communication devices, in an effort to change the lives of these children. The Center educates therapists, teachers, and parents about effective language development strategies through LAMP trainings. These trainings empower the participants with information, tools, and additional resources, and supports clinical research. Jim Nelson is CESA 3’s Regional Service Network (RSN) Director and Non-Violent Crisis Intervention Trainer. Several Richland Middle School students heard a presentation given and attended by adults. Editor’s note: This article is reprinted with permission from the Richland Observer. The Wisconsin Economic Development Corporation (WEDC) believes that the key to the state’s future is its youth and it has provided grant funds to help spur success. Cooperative Educational Service Agency (CESA) 3, which includes the Richland School District, has been entrusted to implement the WEDC Entrepreneurship Support Grant. CESA 3 will use the funds to organize and deliver an Entrepreneurship Skills Academy for 31 school districts in southwestern Wisconsin. In addition to the Richland District, area schools in CESA 3 include Ithaca, Weston, Kickapoo, North Crawford, River Valley, Riverdale and Boscobel. CESA 3 is one of 11 Wisconsin organizations to receive grants under WEDC’s Entrepreneurship Support Program, which helps fund activities such as the promotion of entrepreneurship; entrepreneurial education, mentorship and training; and business development and financial services. WEDC awarded $500,000 in matching grants statewide. During the upcoming months at Richland Middle School and other schools in CESA 3, student teams and supervising teachers will be provided with $500 in startup funds to begin a business venture. Opportunities will be provided for each team to have local mentors, who will be guided by CESA 3 project leaders as they work together to develop a product and plan. CESA 3 will offer up to $500 in additional funds to each team. An event will be held in the autumn of this year to showcase each team’s final plan and product. Hosting the event will be local business partners, with the aim of bringing together people from the region to celebrate the teams and their projects. Although additional collaborators include Prosperity Southwest and the Southwest Wisconsin Workforce Development Board, all matching contributions will be provided by CESA 3. The regional training model – called the Entrepreneurial Skills Academy (ESA) – includes a day-long workshop, product development activities and the showcase event. On Jan. 23, several Richland Middle School (RMS) students were invited to the school’s IMC (instructional media center, formerly termed school library) to meet with school officials and representatives of WEDC, CESA 3, and Prosperity Southwest Wisconsin. The students were informed about the Entrepreneurship Skills Academy and heard from several of the adults who were present. CESA 3 School-to-Work Coordinator Tom Martin introduced his fellow CESA 3 School-to-Work Coordinator Chuck Keller and stated that they would be closely involved with the project. Martin stated that RMS students need to start thinking about the types of projects they will work on. “Maybe a new phone app,” he said. “What inspires you to keep going? Entrepreneurship is about building; opening doors.” He gave as inspirational examples: Bill Gates of Microsoft, Steve Jobs of Apple, and – closer to home – George Smith of S&S Cycle. CESA 3 Gifted & Talented Coordinator Meredith Biba said that, on March 12, each CESA 3 school involved in the project can bring a certain number of students to Southwest Wisconsin Technical College (SWTC) to learn how their pitched ideas can become a reality. “We’re looking for kids who are innovative, exciting and hard working,” Biba said. She stated that students will learn how to prepare speeches, prototypes and business plans. Area businesses will consider providing additional funding for the plans. Dawn Kiefer is editor of the Richland Observer. Richland Center, Potosi, Boscobel, Darlington, River Ridge, Lancaster, Platteville and Southwestern school districts took part in a Project SEARCH Tour Day at the University of Wisconsin-Platteville in October. Project SEARCH is a nine-month high school transition program that provides training to enhance employability skills for individuals with intellectual disabilities (18-21 year old students who have completed their high school graduation requirements). The cornerstone of Project SEARCH is total immersion in working opportunities at UW-Platteville. Five days a week (September – May), students will report to the University of Wisconsin-Platteville to learn job skills while participating in a variety of hands-on internships/experiences on campus. A certified Special Education Teacher and Skills Trainers will work with the students and the UW-Platteville staff members throughout the school year. Students will conclude each day back in the classroom setting for reflection, problem solving, and an opportunity to discuss their learning experiences from each daily experience. “The program is designed to really allow for students with more significant disabilities and challenges to gain important community based skills around employment, vocational skills training (this is a primary role of the skills trainers and the teacher on site) as well as the ability to work side by side inclusively with non-disabled peers,” explained CESA 3 Transition Improvement Grant Coordinator. All Project SEARCH students are enrolled in Division of Vocational Rehabilitation (DVR) during the training program. Once the school year is completed the graduates continue working with them to find integrated community employment. Employment rates in Wisconsin for students who complete Project Search are over 80 percent. Applications for Project SEARCH are due by Jan. 10, 2018. To learn more, contact Kenney at bkenney@cesa3.org or CESA 3 Regional Service Network Coordinator Jim Nelson at jnelson@cesa3.org. Brian Kenney is CESA 3’s Transition Improvement Grant Coordinator. Jim Nelson is CESA 3’s Regional Service Network Coordinator. Cardinal AG and the Richland Center School District have built a strategic relationship with the help of CESA 3. Sometimes the stars align at the right time. Richland Center Technology/Engineering teacher Ed Levy was looking to find opportunities for his engineering students. Richland Center Agriculture teacher Heidi Garrett identified the need to upgrade her metals shop and was looking to find industry best practices. Richland Center High School Principal, Jon Bosworth, was looking for ways to improve career readiness for his students. Cardinal AG Human Resources Manager Mandy Spurley and CNC Programing Manager Mike Keller are looking for workers with employability skills and some technical training. With the help of CESA 3, the two organizations are building a strategic relationship to create opportunities for students. In early December, a team from Richland Center High School toured Cardinal AG. As a result of this tour, Garret is working towards upgrading her CNC and welding area with the help of Keller. Levy will be partnering with the Cardinal AG engineering department on software design systems. Cardinal AG will look to provide career exploration opportunities for students such as Youth Apprenticeships. If you are looking to create strategic partnerships between your school and local businesses, please contact CESA 3 School-to-Work Coordinators Tom Martin (608-822-2154) or Chuck Keller (608-822-2163). Chuck Keller is a CESA 3 School-to-Work Coordinator. He also oversees Northern Region/Youth Apprenticeship. Dr. Lisa Arneson (left), Director of CESA 3's School Improvement Division, recently attended the AESA Conference. I was lucky enough to represent CESA 3 and Wisconsin at the national Association for Educational Service Agencies (AESA) in San Antonio recently. This year’s theme was Equity, Inclusion, and Social Justice. Our state had a large delegation, and my task was to share the work and collaboration being done with WISEdash, the state’s data system. I connected with many ESA staff from other states to learn how they support their schools and explore innovative ideas for CESA 3. The sunny, 75-degree weather was a plus. I’ve included my thoughts from one of the several insightful presentations below. The title of the slide grabbed my attention: Stop Assuming Your Students Already Know How to Behave. Most Don’t Know. The presenter, Eric Jensen, author, researcher, and national expert on teaching students of poverty, was in the middle of his keynote at the AESA Conference in San Antonio. While I knew, based on the fundamentals of PBIS, that teachers must teach and reteach how we want our students to behave, the behaviors were not always named. According to Jensen, some children, especially those in poverty, often don’t have these skills and aren’t equipped to deal with situations that require them. He emphatically insists that we need to teach these skills daily by modeling, providing explicit instruction, building trusting relationship with students, and helping parents to see the connections between social and academic skills. The presentation focused on leadership to transform schools, and towards the end, he shared a “free gift,” which I am including here. Jensen’s “15 Evidence-based Change Solutions to Transform Any School” is available at www.jensenlearning.com/15_solutions. Check it out, and let me know if you are interested in bringing Eric Jensen to CESA 3. Dr. Lisa Arneson is Director of CESA 3’s School Improvement Division. Educators attended an EPIC meeting at CESA 3 related to the CESA 6 Educator Effectiveness Project. Several area administrators attended an Effectiveness Project EPIC meeting at CESA 3 in Fennimore earlier this month. The CESA 6 Effectiveness Project is available to school districts statewide. It is a comprehensive evaluation model with a framework to evaluate all staff in a district, from district administrator/superintendents, to central office and school administrators, as well as teachers and educational specialists. Among the attendees was Boscobel Area Schools District Administrator Greg Bell Jr. The Boscobel School District utilizes the CESA 6 Educator Effectiveness Project. Nearly half the school districts in CESA 3 utilize the CESA 6 Educator Effectiveness Project. “The EPIC meeting is for those who set up and manage the software system associated with the model,” explained CESA 3 School Improvement Division Director Dr. Lisa Arneson. Several high school students assisted with the two-day ACTFL training by volunteering to be interviewed. As a student is interviewed, others in the room watch and take notes. CESA 3 hosted ACTFL Oral Proficiency Interview Training for Spanish Teachers on July 10. Participants have the opportunity to continue their work with ACTFL to become Certified OPI Testers, which would require a rigorous training process, elevating the educator to elicit and rate oral proficiency interviews with a high degree of reliability, Arneson elaborated. Students' ratings could go on their high school transcripts to demonstrate a meaningful performance level that is recognized at most colleges. Jessica Wick of the North Crawford School District took part in the workshop. “The CESA 3 Spanish teachers have been meeting for a few years now. We started out just meeting and sharing ideas and experiences, and have since made an effort to become a true Professional Learning Community (PLC), which means working toward a common goal,” she said. “We were all interested in better understanding the ACTFL proficiency scale to use as a common assessment tool in our classrooms, and this training seemed like the best way to go about that. Several high school students assisted with the two-day training by volunteering to be interviewed. The ACTFL Oral Proficiency Interview (OPI) is a 20-30 minute one-on-one interview between a certified ACTFL tester and an examinee. The interview is interactive and continuously adapts to the interests and abilities of the speaker. “This was an amazing opportunity for us. OPI certification is something that many college professors have, but not many high school teachers. While not everyone in the group is going to pursue certification, we all learned so much about how to better gauge our students' fluency, and the proper language to use while doing so,” Wick said. “This will be very useful and meaningful for our students as they move on. Saying ‘I’ve had 3 years of Spanish’ doesn't really give much information to a college or an employer, but ‘I’m at the intermediate-low level of proficiency’ is normalized language that is used nationally that tells a lot about what a person can and cannot do with the language. Bryn Orum (left) led CESA 3 educators in a College-Ready Writers Project workshop in Fennimore last month. Area educators are learning the ‘write stuff’ through a multi-part workshop at CESA 3 in Fennimore. The College-Ready Writers Program is designed to improve the argument writing of students in grades seven through 10 by introducing teachers to new instructional practices. As with all National Writing Project work, local university-based site affiliates provide the professional development in their local service area. Greater Madison Writing Project Outreach Specialist Bryn Orum led 14 educators in a four-day workshop late last month. This was Orum’s first opportunity to work with teachers at the College-Ready Writers Project program. She is also facilitating another group of teachers working with the materials this year an plans to work with several high-needs, rural school districts in Wisconsin in the coming years. Cuba’s City’s Susan Meier was one of 14 educators to take part in the July 24-27 workshop. “I took the class because I wanted to explore more relevant teaching strategies to share with my junior and senior students,” she said. “The emphasis for argument writing in the Common Core State Standards has geared my vision of providing students with the tools to make and write good arguments. Educators participating in the College-Ready Writers Project will gather quarterly throughout the school year to share their experiences. “At each quarterly meeting, the participating teachers will bring in student work to assess using a formative assessment tool that is part of the C program,” Orum explained. “The formative assessment will allow teachers to see where students are at and what they need next to continue developing as argument writers. Board of Control members are, front row from left: April Jennings, Renee Linscheid, Wendy Stitzer, Jill Gaskell; back row: Mike Humke, Rick Roflsmeyer, JoAnn Wiederholt, Bob Hermanson, Mark Johnson. Not pictured: Gary Andrews, Janet Matthes. Two new candidates were elected to the CESA 3 Board of Control during the CESA 3 Delegate Assembly Convention on July 27 in Fennimore. Wendi Stitzer of the Boscobel School Board will represent Area I. Area I member schools are Boscobel, North Crawford, Prairie du Chien, River Ridge, Seneca and Wauzeka-Steuben. Renee Linscheid of the Iowa-Grant School Board will represent Area III. Area III member schools are Barneveld, Dodgeville, Highland, Iowa-Grant, Mineral Point and River Valley. Incumbents Jill Gaskell, Pecatonica; and Bob Hermanson, Darlington; will represent Area IV. Area IV member schools are Argyle, Belmont, Benton, Black Hawk, Darlington, Pecatonica and Shullsburg. Stitzer and Linscheid join Board of Control members Mark Johnson, Seneca School District, Area 1; JoAnn Wiederholt, Fennimore School District, Area II; Mike Humke, Dodgeville, Area III; Janet Matthes, Kickapoo School District, Area V; Rick Roflsmeyer, Pecatonica School District, Area IV; Gary Andrews, Cuba City School District, Area II; and April Jennings, Weston School District, Area V.
Last Thursday night’s Delegate Assembly Convention was the first for new CESA 3 Agency Administrator Jamie Nutter. “The energy Jamie puts out at our meetings is fantastic,” Humke said. “I think he is going to bring a lot of energy into our building here and it is going to be fantastic for us." Matt Renwick led a Digital Portfolio in the Clasroom workshop at CESA 3 in Fennimore on July 18. More than 20 area educators attended a Digital Portfolios in the Classroom workshop at CESA 3 in Fennimore on July 18. Mineral Point Elementary School Principal Matt Renwick led the workshop, which was made possible through a CESA 3 TEACH Grant consortium. "With the spreading use of computers and mobile technology in schools, going digital with student portfolios has become more popular. Simply put, digital portfolios are online collections of student work," Renwick said. "They allow us to archive, curate and analyze samples of student learning from both the past and the present and keep that data -- literally -- at the tip of our fingers. "Students and teachers can use digital tools to document current understandings, make revisions as thinking changes, share student products both locally and globally and celebrate successes with peers and parents. Although this practice is only one part of a balanced assessment system, there are many benefits that learners, both student and teacher, can gain for developing digital portfolios." Renwick has led two workshops on digital portfolios this year, having also led a workshop for CESA 4. He facilities half-day and full-day workshops. "I've also led conference sessions on digital portfolios and authentic assessment, including ASCD, NCTE, and WSRA," he said. "If a school or district is interested in engaging in curriculum work, I can facilitate a second day for teachers to integrate digital portfolios into their performance tasks and learning progressions." Renwick's credentials include a masters in educational administration and certification as a director of instruction. He teaches online courses in curriculum and instruction for the University of Wisconsin-Superior. Amy Flynn was one of seven Lancaster School District educators to attend the workshop. "I took the class because I wanted to learn more about how to infuse technology applications in to my classroom instruction," she said. "This is important to me as we look toward our 1:1, student/device initiative this next school year. "What I liked most about the workshop is the wealth of web-based resources the instructor shared with us to help support technology-based student activities and projects. I am not very tech-savvy, so giving me the sites and time to explore the applications for building technology integration into my class was very beneficial." Digital portfolios are becoming more prevalent in southwest Wisconsin. The Highland School District recently approved a policy requiring all students to create an online portfolio. "This practice is becoming more common among other schools, and Highland will be elevating their expectations of the students' work by designating a certain portfolio work day and a weekly portfolios and grade check to make sure the students are maintaining their studies," summarized the Dodgeville Chronicle in a July 13 article. "I would also hope that Highland and similar schools have created a digital portfolio system to better assesses the whole child by using qualitative data as evidence of learning, including video, images, audio and text," Renwick said. "Having a portfolio work day, with the aid of a reflection protocol, could really help with student metacognition so they can learn how to learn. "Traditional assessments are vague about student proficiency or growth. Numbers and symbols, i.e. grades, distort the visibility of student learning. Digital portfolios can become that next step in closing the distance between what students understand and how that understanding is represented for an authentic audience and for themselves as learners." To learn more about CESA 3's School Improvement offerings, contact Director Lisa Arneson at larneson@cesa3.org.